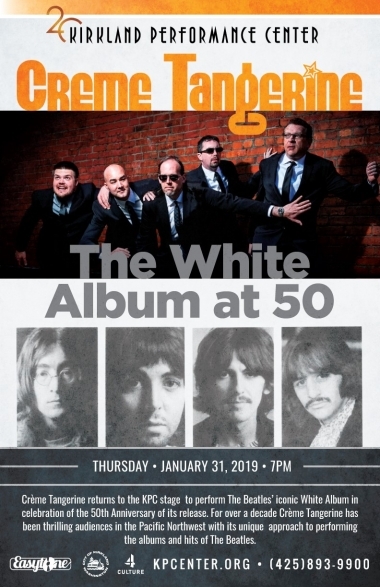 Creme Tangerine will perform all 30 tracks of The White Album in its entirety to celebrate the 50th anniversary of the release The Beatles diverse and adventurous masterpiece. Creme Tangerine is a dynamic five-piece band from Seattle that performs the music of The Beatles for thousands each year. Their performances have included The Beatles most recognized hits as well as different eras of the Beatles music and “The White Album”, “Abbey Road”, “Sgt. Pepper’s Lonely Hearts Club Band”, and the “Rooftop Concert” in their entireties. For over a decade Creme Tangerine has been thrilling audiences in the Pacific Northwest with its unique approach to performing the music of the Beatles. Hailing from Seattle, WA, Creme Tangerine performs for thousands each year and creates a dynamic live music experience filled with energy, fun, humor, and spontaneity known only from the Beatles and this favorite era of popular music. Rather than focusing on the personalities or look of The Beatles, Creme Tangerine focuses on performing their beloved music live for all to enjoy. Their performances have included The Beatles most recognized hits as well as different eras of the Beatles music and “The White Album”, “Abbey Road”, “Sgt. 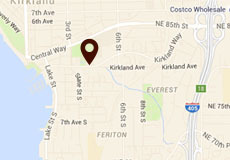 Pepper’s Lonely Hearts Club Band”, and “The 1969 Rooftop Concert” and “Seattle 1964 & 1965 Concerts” in their entireties. Their high energy, quality performances appeal to those already familiar with and new to the music of The Beatles.